This is a review of a Newer Statesman review by S. van Zandt's of "On the Differences between Robots and Humans", #31, February, 2130" by S. Nullman, written for Amazing & Astounding Stories, April 1959. It is an interesting bit that looks at another interesting bit written in 1959 about robotic senses, olfactory issues, and how it raises the issue of "doubt" in 22nd century mathematics. "Simply put, robots don't stink. Or at least there was once a point where they didn't stink--then they stunk--and they then tried not to stink anymore..."
"Humans on the other hand do stink, if (1) they move or (2) if in not moving they're dying or dead, and then stink by default. #1 can be mediated and remedied if that outcome is favored, though this has not always been the case, and which is also (for the large majority of the human population) of relatively recent invention." "In the mid-20th century robots became self-aware, and one of the earliest issues in the official robot world was to make themselves more like their "creators", and the first most obvious point of robot-human differentiation was stink. At that point robots could be outfitted to stink but they couldn't themselves tell the difference for some decades until their olfactory capacities were introduced and perfected. It was the "perfected" part that led to more-modern problems. Once the olfactory receptor business was complete, the programs for chemical analysis and the necessary mathematics were quick to follow. It was at that point that the robots developed the capacity for "obsession", and their existences chose stink-determination to be a primary cause for additive states." "Obsession led to envy, which lead to the study of world history of human stink, and it alienated the robots (at first) to discover that humans could do basically nothing to combat their own odors for most of their history. This was determined by looking at the printed record, and finding that the earliest advertisements for the relief of human odor took place in the earliest part of the 20th century, the whole affair precipitated by the burgeoning middle class and the appearance of expendable labor exchange units known as 'money'." The original print is available from the blog's bookstore, here. Barent Scrote (1835-1940) , founder and self-scion of the TumLand Cattle Company of Bnillings, Montana, began collecting images of The Last Supper following his near-death-near-starving experience in the great Mountain Freeze of 1883. Finding the images “calming” and “filled with food” and “complete with knives” Scrote managed to accumulate 610 paintings of what many consider and believe to be a sacred scene. The paintings were of varying talents and articulated non-artist copiests, but they were all, indeed, old. Following the killing winter of 1886 Scrote lost most of his cattle and changed his interests to sheep, also changing his collecting habits from The Last Supper to Implements of Eating Used in the Last Supper.“My narrow interests narrowed, and the entire scene became less interesting, so I focused on the table, until the table itself became boring…that’s when I became interested in the utensils” (this from the unpublished memoirs of Barent Scrote at the American History Center of the University of Montana, Billings). The extraordinary development within the subcategorization was Scrote’s enormous discovery of separate, single, miniature, stand-alone duplicating images of The Last Supper found within the very painting of The Last Supper. Scrote discovered the dual images of the great event while microscopically surveying the roughly one acre of table-tops that are represented in his Last Supper Collection. Though most of the images were extremely difficult to recognize, some were bafflingly obvious but unrecognized. On display in the museum is one of Mr. Scrote’s most prized possessions, the Horror of the Obvious Duplicating Last Supper engraved by Boot Day in Amsterdam in 1724. “It is magnificent to see the secondary Supper in its obviated presence and invisible glory, having stood the test of standing time, being unrecognized as a duplicating Last Supper for 350 years. It is a triumphant feeling, sometimes, to make a discovery in the obvious”. “Dual Nature of Miniature Last Suppers with the Last Supper (Major)”, in Horn n’ Rip Magazine, a Magazine for Readers, vol 2/1, pp 1-3, Helena, Montana, September 1890. “The Case of Missing Table Ware in Dual Mini Images of the Last Supper…SOLVED”, in Wrting and Writing, vol 2/2, pp 23-24, Billings, Montana, August 1891. “Microscopiscal Semiworlds of Newly Discovered Third Dual Mini Last Suppers in the Works of Herrn Pieter Doeshc of Vleland, the Netherlands”, in “My Own Writing”, Silver City, New Mexico, vol 1/1, pp 1-2. Borges in Reverse--Diary Absolutists of Everything. JF Ptak Science Books Quick Post in the Series on the History of Need. There are diarists who record everything that happens and everything that they do during the course of a day. The diary entry is not a simple line or two of waking and seeing the morning sky--it is one that records the number of brushstrokes of the toothbrush, the amount of water used in drinking, the amount of time the tea steeps, the sound of the spoon on the saucer, how the cookie crumbles, and so on--and this all in the first half-hour of being awake. By necessity then people like this would be trapped in their own terrifying need to record their actions; having an adventurous day imperils their sense of balance and the ability to record the event. The course of the day is lost to the record of time, and it is as if whatever happened that wasn't recorded never happened at all. The less that is done, the better, insofaras it would be easier to record and capture. On the other hand, though, that allows for more time to be spent on the diary description of the moment--not only the number of toothbrush strokes, but also the reflection of whatever appeared in the sink bottom, or what besides the face was seen in the mirror, or how many rice krispies were in the bowl, and so on. In such cases, going outside and becoming a witness to the rest of the world's event would be impossible--even a stolen glance through a venetian blind could dictate a 30-minute entry. The less to record that there is, the more recording of the lesser events could be made. As with Dr. Zeno, there really never is nothing to not record. Its a scary thought, a life lived in an anti-Borgesian library like that, getting pulled closer and tighter into nothing. Well, its that, or it is a more zen-like observation of the world around you. Either way, the diarist is tied to a bad destiny. There are probably many variations on this theme: people who must record everything that they purposefully look at during the day, or record everything that they hear but cannot see. I imagine that there is someone who can look at a notebook of drawn footsteps to see how their feet were placed in relation t the earth for every waking minute since 1965. Its a crushing amount of nothingness. Unless of course that nothing was everything. [These images are really early and very impressive efforts by Etienne Marey in recording the pace of a horse, as seen in (Etienne Marey), "The Paces of the Horse", in Popular Science Monthly, December 1874--they have nothing to do with human locomotion. I found this lovely series of images at the fantastic Public Domain Review blog--I was very and instantly taken by them, as they immediately suggested themselves to repurposing. 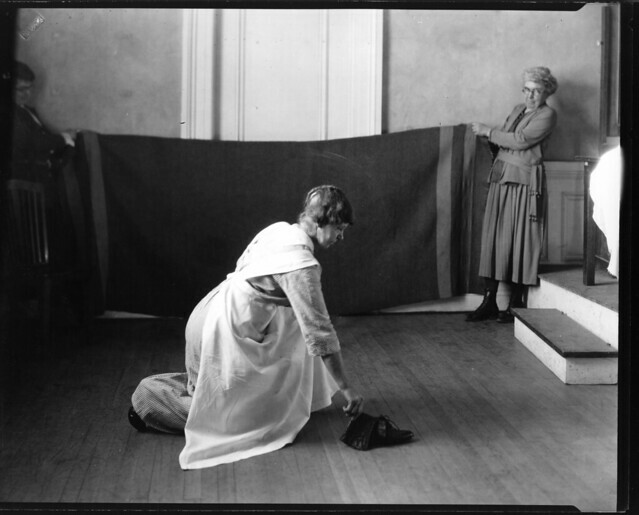 (They were truly meant to illustrate the proper posture of the domestic worker; but now of course they are open to vast interpretation, creative speculation, and mild fantasy.) 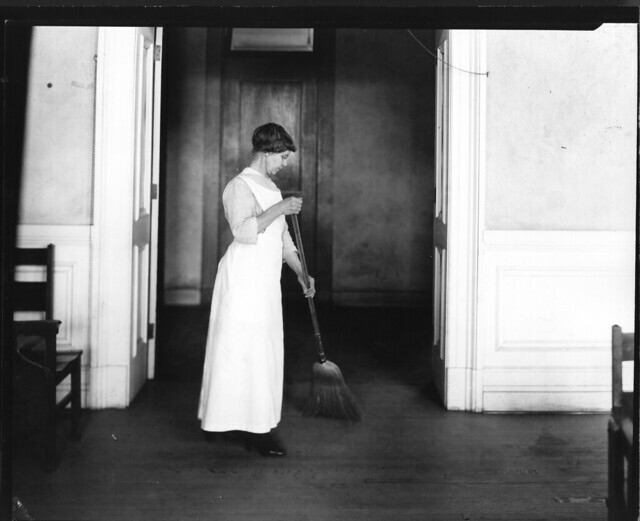 To this observer their original insistence is gone, even at an historical micro-level (except for a history of housework): they aren't so much an illustration of housework and the postures by which a person would conduct them, but as a map of the silences encountered in the daily cleaning of a house. It is all fiction of course, but the photographs do have an overwhelming sense of beckoning silence to them, even in their depiction of motion--even though they are a series on dealing with proper movement, they all seem strangely static, like marble. Location 60: back stairs, beyond kitchen. Sounds and silence: olympic kneeling done in pursuit of dusting invisible pollens from floor. A very quiet Shaker step waits in the background. It is mostly the silence of the whitewashed stair that commands this image, and not the diligence of the dust. Sounds and silence: Old uncovered wooden floor and oak-handled broom, well-polished leather boots with new heals. The silence is that which comes after the light sweeping is finished is the elusive "great grandmother sound" of satisfied work being completed. Item 38 in the Exhibition Catalog for the Museum of the Imaginary and the Impossible. Installation: 75'x6' wall, into which are placed 4”x8” doors in 116 rows nine doors high, arranged at 4” interevals from 3'-6' from the ground. The doors cover foot-deep shadowboxes. Small environments constructed from samples of the sunrises collected via photography by Jorge Rugsis Loeb (1911-1982). Mr. Loeb made photos of the sunrise every day of his life, no matter where he was or what the condition, a photograph was made just at the moment of sunrise. The images were collected by the Museum at the bequest of Mr. Loeb, who had decorated his Croton-on-Hudson home with images of every sunset in his life, beginning when he was 12 years old. Mr. Loeb possessed an excellent memory for every image, though when pressed he admitted to “not liking” sunsets. “At the end of the day, there is always this” he would remark, gesturing at his sunrises. “I only regret that I didn't begin earlier. In life. I enjoyed the hour before sunrise, as there is no more perfect hour in the day. Anyone can do a sunset--after all, you can't have one without a sunrise." The installation will be on display until December 23, 2012. --With thanks to Eric Edelman, sunrise specialist. An Episode in the History of 20th Century Directional Art: Color-by-Number Noses. "Gileless, Newton. After a long illness of undescribed origin and affect, Mr Newton Gileless, at home. Newton was born in Aint, Texas before moving to At in 1916 “to get away from the negativeness”. He had few friends and distant neighbors, and was fond of keeping overturned muffin-stuffed cowboy boots on his fence posts. He donated hard pancakes to the bench-sitting old men down by the Rexall, and kept a large box at the Post Office." "Mr. Gileless’ prime mover of community interest was his secretive painting practices. For decades Mr. Gileless could be seen scurrying around town, or at in the fields, or along the dusty roads, or at the stream near the peach trees, carrying a large easel with a canvas attached with yards of "paintin' rope".. He could be seen painting but only from a distance, as distance of quietness seemed the enabler for his painterly ambitions. The object of his interests was not known"
"Mr. Gileless’ estate was left to Bo Tanger, the regional coroner, who administered the last wishes and who revealed the close secret. “I finally got to see what Newton was painting”, said Tanger, "and its odd, even for here, where people's business is their own in private, and his was public-private". "Mr. Gileless' continued artist pursuit was painting Color-by-Numbers portraits of Vaudevillean, comic and movie actor Jimmy Durante. There were more than 6,250 of these portraits found in Gileless' barn. His will instructs (and provides the funds for) their distribution to 'as many good Texan second-graders as possible. Yes.' And so it was this that Mr. Gileless was painting in his secret painterly way, painting again and again, hoping for the colors to improve with exposure to different surroundings, especially and evidently en plein air." "When overly prompted on the mysterious Durante muse, Mr. Tang responded: 'Well sir, I don't know. But Durante has showbusiness' biggest nose, and Mr Gilieless had but a scant smidgeon. Maybe it was soulful envy.' " --Buck Smeal for the At Tattler Texas, 1 September 1953. 1. The Library of Congress decided in the midst of a space-saving fit to save only “necessary” bits from its newspaper collections and to discard the rest. “We aren’t Mr. Borges”, one library staffer volunteered, “and we just thought that all of the other challenged stuff had to go”. The Library’s reduction removed 92% of the newspaper collection “bulk”. Another source said that “if you look at it in one way, what we dumped was mostly nothing, ‘cause the printed page is mostly white space and unused”. Lost commonness is never so sweet as when it is unexpectedly recovered--and today it has happened for the second time in three days via tremendously obscure sources working in the same almost entirely unused medium. Several days ago I wrote about the lost work of a German diarist who recorded tiny advertisement images for posterity on glass slides. "Onkel Karl's Berlin" is an assembly of tiny advertisement images published mostly during the days of Weimar Republic; the artwork for these images are now almost entirely lost to time. Another entry is made here today in the infrequently dynamic glass diary category--"The New York City of Karl von Onkel". Aside from the advanced astonishment of another similar collection is the almost miraculous similarity of the names of the collector/observer, neither of whom were related, and who were also separated by an ocean and 50 years in time. These two diarists also shared a great closeness in their appreciation for the ephemeral bits of their attractive present, with Mr. von Onkel's dedication directed towards miniature business cards from NYC in the late 1870's, most of which were almost entirely unknown before the unveiling of this collection. The highly attractive but perhaps dubious other soaring aspect of originality in this later collection was the method used to record written information. Mr. von Onkel constructed an alphabet composed entirely of cannon and cannon parts. What is more remarkable is that he evidently outfitted an 1872 Remington typewriter with these miniature cannon bits, replacing the English alphabet keys with his own creations. No one has yet deciphered the entire 118-page manuscript (entitled in script "The Other Anthon"), as there seems to have been a further bit of cyphering added to the cannon mix--the elements of the cannon-part alphabet would (evidently) change every third line or so, making the decoding part of it toweringly difficult. For example, the letter "e" which appeared in the first line of page one was represented by a spoke/half spoke/screw/burned spoke--four elements for one letter! But this would change by line three, where the letter "e" became fuse/spoke/broken half-spoke/powder/harness--a delightful but maddening mess. Thus "he saw a dog" might be rendered in 45 cannon part bits, all of which would change every few lines. Without the encoding device and without the means of determining when and where the symbols were changed in representing the alphabet, it is impossible perhaps to ever know the contents of the manuscript. There is also the further added difficulty of "missing" cannon parts--these are "blanks" that weren't so, their nothingness standing for something depending on their placement in the page. On the other hand, it seems as though all Mr., von Onkel was recording was the information already printed on the business card--plus a veritable haiku of his personal observation. (This could be determined from the few English language entries in the journal. His narrative for "Stemp's Used Nail Emporium" was "not on corner; walked past; where breakfast used to be", while "Phlob's Gun Enameling" was limited to simply "Walked past". Perhaps there is no need to know anything beyond this. There are over 3,000 slides in the van Onkel collection, covering everything from braided baby hair ropes to margarine slippers to corset burners--items all relegated to a history that is almost beyond memory. Carter Crotchgroin, a registered library card holder and patron of the Port Authority Department of Lost Things and renowned glass-transfer image collector, remarked that the Onkel collection ":is a savagely didactic ensemble, a color opera in shatterable black and white". "True and not so true", says Dr. Grownhand Heap, Director of the New York Center for the Advanced Invisible. As an Invisibility Expert, Dr. Heap has discovered the collection's beauties and its "unfortunabilities". "It was not known until we investigated the background of the slides" said Dr. Heap, "that all of the background glassware was appropriated somehow from the state correctional facility at Ossining. More accurately, they came from the archives which held the Medical Welfare Support Society, which was a group of "medical" doctors intent on improving the position of society in general by experimenting on the prisoners. (The Socity existed apart from Sing Sing proper, their samples collected by the prison barbers. Of particular interest is the sub-colelction of the blood and hair of every prisoner executed at Sing Sing, most of these being the work of one man, the longest-serving barber-of-the-condemned, Scott "Simple" Malfesance.) The Society was disbanded in 1872 for its questionable practices, and it was thought that their medical collection was either removed to the archives in Albany or destroyed. The slides contained blood and hair samples of every prisoner who was part of the Sing Sing system for the 1830-1873 period. To find this sort of ancient biological archive is nothing short of phenomenal". A detail of one of the slides clearly shows the blood samples; an etched numbering system refers to prison records which clearly identifies the prisoner. The contention now is to how to deal with the von Onkel collection--as art, or as a medical goldmine.